Last week I described how to use PROC IOMOPERATE to list the active SAS sessions that have been spawned in your SAS environment. I promised that I would share a custom task that simplifies the technique. Today I'm sharing that task with you. You can download the task from this SAS communities topic, where I included it as an attachment. The instructions for installation are standard for any custom task; the details are included in the README file that is part of the task package. You can also view and pull the source code for the task from my GitHub repository. I built it using Microsoft .NET and C#. 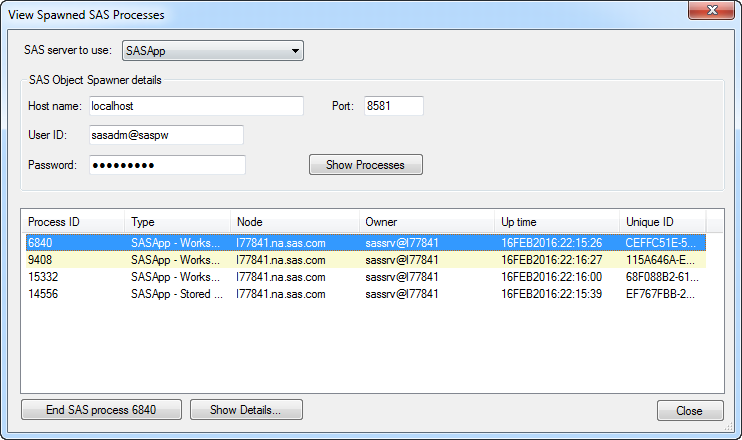 The task works by using PROC IOMOPERATE to connect to the SAS Object Spawner. You'll need to provide the connection information (host and port) plus the user/password for an account that has the appropriate permissions (usually a SAS admin account). Note that the port value is that of the Object Spawner operator port (by default, 8581) and not the SAS Metadata Server. Did you try the task? How did it work for you? Let me know here or in the SAS communities. If you're professionally interested in how to build custom tasks, this example shows several techniques that implement common requirements. Use the source code as a reference to review how these are built (and of course you can always refer to my custom tasks book for more guidance). Submit a SAS program in the background with the SasSubmitter class. There are two examples of this in the task. The first example is an asynchronous submit to get the list of processes, where control returns to the UI and you have the option to cancel if it takes too long. With an asynch submit, there are some slightly tricky threading maneuvers you need to complete to show the results in the task. The second example uses a synchronous submit (SubmitSasProgramAndWait) to stop a selected SAS process. Read a SAS data set. The SAS program that retrieves a list of processes places that result in a SAS data set. This task uses the SAS OLE DB provider to open the data set and read the fields in each row, so it can populate the list view within the task. Detect errors and show the SAS log. If the SAS programs used by the task generate any errors (for example, if you supply the wrong credentials), the task uses a simple control (SAS.Tasks.Toolkit.Controls.SASLogViewDialog) to show the SAS log -- color-coded so the error is easy to spot. Retrieve the value of a SAS macro variable by using SasServer.GetSasMacroValue("SYSJOBID"). This pulls the process ID for your active SAS session, so I can compare it to those retrieved by PROC IOMOPERATE. That's how I know which list item to highlight in yellow. Save and restore settings between uses. Entering credentials is a drag, so the task uses a helper class (SAS.Tasks.Toolkit.Helpers.TaskUserSettings) to save your host/port/user information to a local file in your Windows profile. When you use the task again, the saved values are placed into the fields for you. I don't save the password -- I'm sure that I'd get complaints if I did that, even if I encoded it. The post A custom task to list and stop your SAS sessions appeared first on The SAS Dummy. If you're a SAS administrator, you probably know that you can use SAS Management Console to view active SAS processes. These are the SAS sessions that have been spawned by clients such as SAS Enterprise Guide or SAS Add-In for Microsoft Office, or those running SAS stored processes. 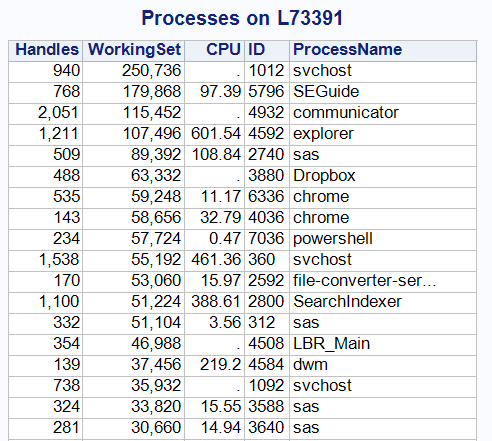 But did you know that you can generate a list of these processes with SAS code? It's possible with the IOMOPERATE procedure. 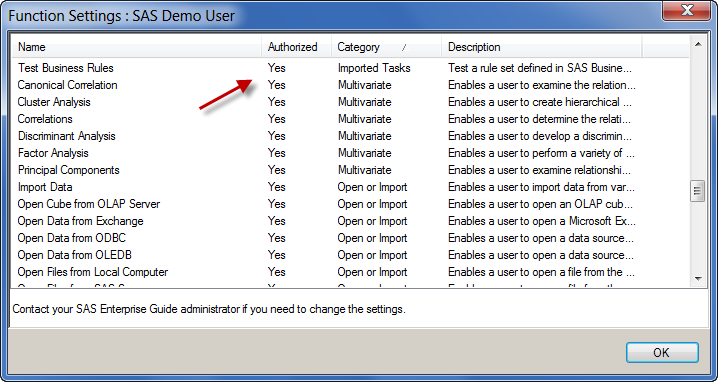 You can retrieve more details about each process by running subsequent IOMOPERATE steps with the LIST ATTRS command. This can get tedious if you have a long list of spawned sessions. I've wrapped the whole shebang into a SAS program that discovers the processes and iterates through the list for you. proc transpose data=work.pids" || y || "
out=work.tpids" || y || "
You can use this information to stop a process, if you want. That's right: from a SAS program, you can end any (or all) of the spawned SAS processes within your SAS environment. That's a handy addition to the SAS administrator toolbox, though it should be used carefully! If you stop a process that's in active use, an unsuspecting SAS Enterprise Guide user might lose work. And he won't thank you for that! It seemed to me that this entire process could be made easier with a SAS Enterprise Guide custom task, so I've built one! I'll share the details of that within my next blog post. The post Using PROC IOMOPERATE to list and stop your SAS sessions appeared first on The SAS Dummy. It shuts down any SAS language feature that provides direct or indirect access to the operating system shell. This includes PROC GROOVY, and the DATA step Java Object and others. You also need to make sure that NOXCMD (shell command integration) and NORLANG (R language integration) are in place, since those avenues would circumvent any SAS-enforced system access. It allows file access to only those directories that a SAS admin adds to a "whitelist". This is the key benefit, since it prevents users from assigning arbitrary file-based libraries. My syntax is for a Windows BAT file. Similar logic applies on UNIX systems, but different syntax. Note: I could avoid this script-level logic by simply creating another SAS Workspace context in SAS Management Console. I would then group certain users to use the locked-down one instead of the unlocked version. I would using SAS Metadata groups to control visibility/access into the appropriate servers. That might be what you want. But if it's not, be sure to either allow the user to access the account's "home" directory, or else redirect the file navigation root to a usable location. Tip for extra stealth: In my example, I used LOCKDOWN PATH= to specify the paths in my "whitelist". As an admin I can obscure that even further by using LOCKDOWN FILE=, and point to an external file (outside of the LOCKDOWN paths) that contains a list of the folders that I want to allow. All other paths are locked down after the "lockdown point" -- when SAS initialization is complete. Thus, if you know that your user needs access to a library or file reference that's not in your whitelist path, make sure that those resources are allocated during initialization, perhaps in pre-assigned libraries. If you decide to use LOCKDOWN in your environment, I recommend that you allocate plenty of time to test -- for yourself and for your users. It's very easy to accidentally exclude a file path that you need to perform work. These might be items that you decide to then add to the whitelist, or else preallocate during the SAS Workspace initialization. Also, some SAS applications are not compatible with LOCKDOWN. So, are you a SAS admin who admires Mordac, the Preventer of IT Services? It's okay to say Yes -- you're just doing your job. You can combine LOCKDOWN with Metadata-Bound libraries to really keep those SAS users in check. My children learned this skill early in life: when you want to secure permission for a questionable activity (say, "watch 5 hours of Phineas and Ferb" or "eat a bowl of candy for breakfast"), you should approach the most lenient adult in the household. In my early days of fatherhood, that adult was me. Typical response: "Sure, I guess that's okay." I soon learned my lesson and implemented a different protocol. "Hmm, I don't know about that. What does Mom say?" That typically shuts them down. SAS administrators have struggled with a similar challenge. It's simple to use SAS Management Console to define SAS libraries and control which users can see/access those libraries. But even when you go to the trouble of "locking down" a library definition within the SAS Metadata Server, a resourceful programmer can usually figure out where the data physically resides and attempt to bypass your "metadata rules" by issuing a LIBNAME statement directly to the data source. SAS admins know this as "the LIBNAME loophole". That's why we always caution against using metadata permissions as your sole security mechanism, and instead be sure to secure your data tables with file system permissions (or database permissions for DBMS sources). Metadata-bound libraries change that dynamic. Beginning with SAS 9.3 Maintenance 2 you can define your data source as a "secure library" in SAS metadata, and bind metadata-based permissions to the library, its tables and columns, and even (with creative tricks) at the row level. If an end user attempts to bypass the metadata layer by issuing a LIBNAME statement directly to the folder with the data sets, guess what? SAS recognizes that there is a security watermark on the tables and frustrates the attempt with the response, "Hmm, I don't know about that. Go ask the SAS Metadata Server." 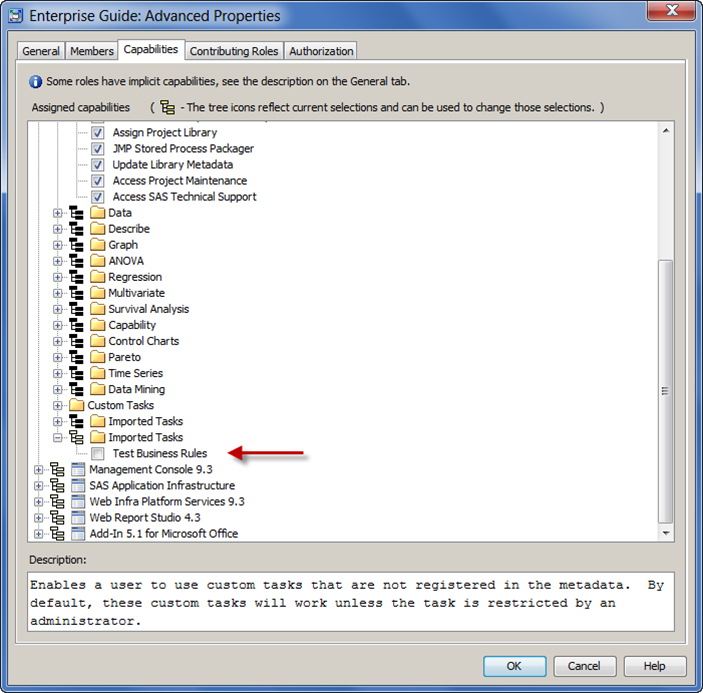 If the user tries to access the tables via direct access in SAS Enterprise Guide, the response is the SAS equivalent of "talk to the hand". cannot be accessed from this product. Note that the password value in the syntax is not a security loophole or backdoor that can grant access to anyone who knows it. It's simply like a PIN for the administrator to later make changes to the contents of the secured library or its properties. Still, admins should guard the password and keep track of it. 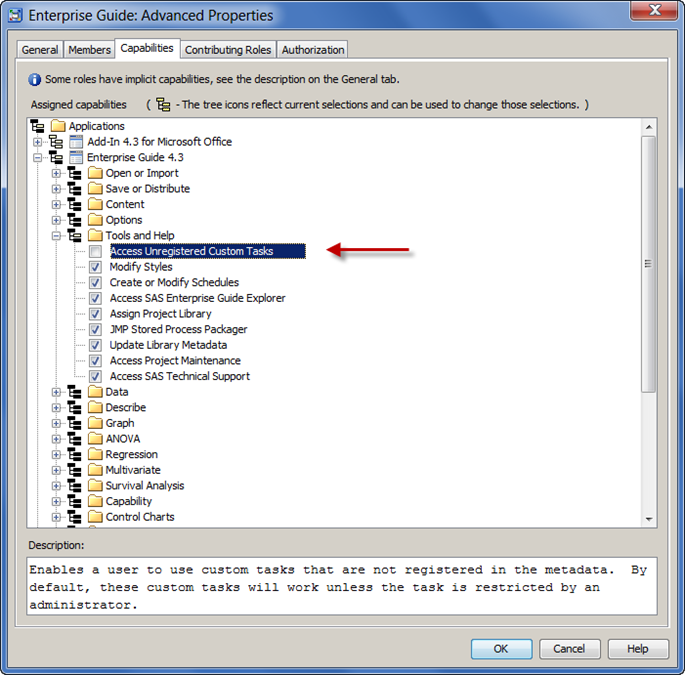 The data tables appear in a special "Secured Libraries" folder within SAS Management Console. If you want the tables to also appear within a traditional SAS libref, you can define a library that points to the path with the standard "New Library" wizard in SAS Management Console. This will provide authorized SAS programmers and SAS Enterprise Guide users with data access for their queries, tasks, and programs. In SAS 9.4, you can further protect your data "at rest" by encrypting the files. You can use system-wide auditing to record potential attempts at security bypass and other events. In a previous post, I described how to write a Windows PowerShell script to connect to a SAS Metadata Server. In this post, I'll show an example of something useful that you can do after you've established that connection. Specifically, I'll show how to "ask" the SAS Metadata Server about the registered SAS libraries, tables, and data columns. I wanted an easy method to "script" a query to the SAS Metadata Server to retrieve a list of all of the registered data tables and columns. 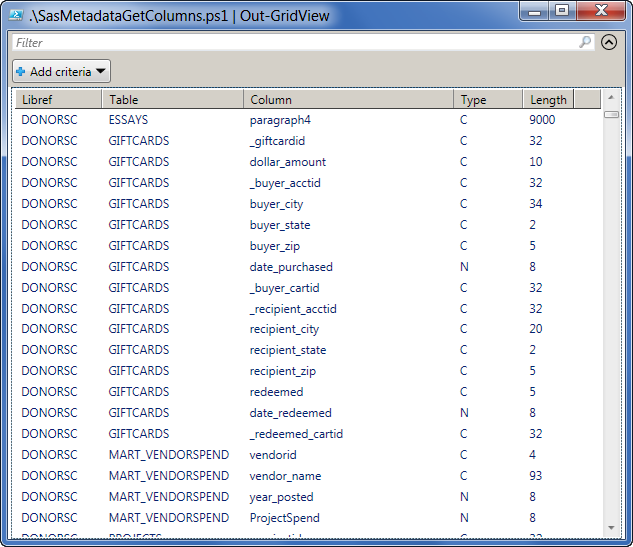 Many SAS applications rely on these registered tables to surface data to end users before making expensive connections to a database to retrieve the "live data", so it can be useful to know the metadata view of things. From a SAS session, you can use PROC METALIB, the META libname engine, and perhaps PROC METADATA to gather this information. In fact, I found this example in the SAS documentation, which shows how to use PROC METADATA and the GetMetadataObjects method to retrieve most of the details I need. But what if I want to script this outside of a SAS session and feed the result directly to a CSV file for auditing or review? # attributes of the nested objects. The full code example is available here (on GitHub). This same approach can be used for other metadata-related queries, such as gathering a list of SAS servers, SAS stored processes, and even users and groups. You can find inspiration and guidance in the many SAS conference papers that feature PROC METADATA. Remember that the metadata that you retrieve, even by using PowerShell, will be limited to what you can see as the SAS metadata account that you use to sign in. SAS Integration Technologies provides a flexible platform to create all types of apps, from simple utilities to full-blown applications. As part of the research for my SAS Global Forum 2013 paper (Create Your Own Client Apps Using SAS Integration Technologies), I've been trying to invent some useful examples that you can run from your Windows desktop. In this post I'll cover how you can use Windows PowerShell plus the SAS Integration Technologies client to connect to a SAS Metadata Server. When working with the SAS Integration Technologies client, you need a way to create the objects that represent the connections to the SAS services. For that, you must use the SAS Object Manager. The SAS Object Manager includes a class named ObjectFactory. As the name implies, the "object factory" class is where your subsequent objects will be created. In our examples, we will use the ObjectFactoryMulti2 class to create the connection to the SAS server for use in our applications. After creating that connection, you can use methods on the connection object to get to the other services we need. To get started with the SAS Object Manager in Windows PowerShell, use the New-Object -ComObject command. Before you can connect to a SAS server, you must define its attributes to SAS Object Manager. A SAS server has several attributes: a host name, TCP port number, and a Class Identifier. The Class Identifier is a 32-character GUID (unique ID) that indicates the type of SAS server that you expect to connect to. CreateObjectByServer returns a connection to the SAS Metadata Server, sometimes called OMI (which stands for "Open Metadata Interface" and is easily confused with IOM). In the above example program, the connection is in the PowerShell variable named $objOMI. Most metadata operations require that you know the metadata ID for the repository in which your metadata resides. For most applications that's the Foundation repository. Even though it has a standard name ("Foundation"), the ID value can differ in each installation. So the next step is to use the GetRepositories method to find the ID value for the Foundation repository. Write-Host  "Foundation ID is $foundationId"
There! The connection is made, and you know the Foundation ID. The next step is to use the metadata API methods (such as GetMetadataObjects) to retrieve useful information from the SAS Metadata Server. I'll describe that in my next post, but if you want a sneek peak you can see the complete code for the example here (hosted on GitHub). As I mentioned in my introductory post about Windows PowerShell, you can use PowerShell commands as a simple and concise method to collect data from your Windows systems -- information that is ripe for analysis within SAS. In this example, I'll show a technique for using a SAS program to call PowerShell and funnel the results directly into your SAS session for analysis. This example uses the Get-Process cmdlet (pronounced /command-let/) to collect information about running processes on a given Windows machine. powershell -Command "Get-Process -ComputerName L73391"
I tested the program on different machines, just to make sure that the behavior of the command and the text file didn't change across machines. You should enable PowerShell scripts to run, as I described in my previous post. Your SAS session must be running on Windows, on a machine where PowerShell is available. Most modern Windows machines will have PowerShell already. But if you are running Windows XP or Windows Server 2003, you might need to download and install Windows PowerShell. Your SAS session needs access to the FILENAME PIPE feature. This is linked to the ability to run system commands. If you're running the program through SAS Enterprise Guide, you'll need to check that proper XCMD options are enabled. This produces a simple report of the active processes on the given machine. Here is a partial example of the output, in descending order of "Working Set" (which is one measurement of the amount of system memory in use by a process).